EASA, which initially received the mandate to develop all the regulatory material for airworthiness, gradually gained competence in all fields of aviation: Air Operations, Flight Crew, Maintenance, Training, Aerodromes, and Air Traffic management (ATM). The field of ATM is probably the most complex one with two coexisting legislative frameworks, the Single European Sky (SES) regulation and the Safety regulation. In its so called SES 2+ legislative package issued in 2013, the European Commission proposes to merge the technical regulatory dimension of the SES with the EASA framework in order to remove the duplications. SES2+ also introduces a clearer separation between service provision and regulatory activities concerning the various ATM and air navigation services. We welcome the clarification proposed by the Commission which enables the Agency to become the technical authority on ATM and to play better its role in this domain. Yet, there is still a lot of work to be done by EASA in particular on the Pan-European dimension of ATM, the civil / military cooperation and integration of new technologies which will significantly improve the overall performance of the European air traffic management system. One of the crucial points will also be to define the funding mechanism for EASA activities in the field of ATM. We need to define a mechanism which would enable EASA to get access to route charges, with the clear understanding that it would result in a net decrease of the cost of such activities to airspace users. I hope the Member States and European Parliament will find an agreement on this subject. 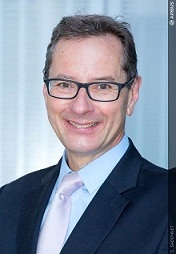 Mr Champion, as we have achieved a major step in the life of the Airbus A350 programme - the granting by EASA of its type certificate - what is your assessment of how the certification process went? I must acknowledge it went well given all new certification challenges linked with the extensive use of composites, or the development of electrical structural network for current return. This could only happen with the continual involvement of people from EASA and Airbus since the beginning of programme. I want to thank them all for their great engagement. To what extent have you benefited from the experience gained in the certification of previous airplane types, especially the A380 to talk about the most recent one? How has the relationship been with EASA throughout the process? We have had, as usual, a very fruitful relationship with EASA despite a quite dense and exceptional workload context: for the very first time, we have launched the application for the A350-1000 (stretched version) while completing A350-900 Type Certification. We have been benefiting from strong Airbus internal procedures, validated by EASA as part of the Airbus Design Organisation approval. This allowed EASA to delegate a part of compliance activities to Airbus, and to monitor its proper application through regular audits. As a good example of this unique relationship between Airbus and EASA, the first flight of an A350 XWB prototype was cleared for the first time 100% within Airbus. EASA audit performed a few months later was considered very satisfactory. We have also innovated in our ways of working with the creation of an “A350 XWB plateau” in EASA facilities in Cologne. We have optimized there both Airbus and EASA teams efforts until Type Certification, with on-site bi-monthly support and a strong project management. This strong collaboration between Airbus and EASA was really beneficial to the programme certification and should be pursued. Now that this milestone is achieved, what will be your priorities for this programme and more generally? What is your vision of the relationship between Airbus and EASA in the future? EASA has a deep knowledge of Airbus processes and we have to further develop and optimize the level of involvement of the agency in the certification activities. We have clear ways of improvement to make the certification process be leaner. The scope is broad as it goes from certification document standardisation, involvement in testing down to use of IT validation tools. Continuous improvement of our processes with EASA is crucial to tackle our next industrial challenges. Certification is an integral part of an aircraft development, and definitely not a parallel process. The more we develop our collaboration with EASA, the more we will succeed to make the world’s best and safe aircraft. It requires focus on what matters and relies on the trust we continue to build in the frame of our long term partnership. 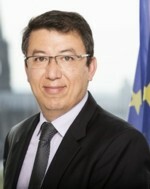 Charles Champion is the Executive Vice President Engineering of Airbus since April 2010. In this role he is responsible for research & technology, overall product architecture and concept development, the design office, integration & flight-testing and continued product airworthiness. The principle of Operational Suitability Data (OSD) is that the aircraft manufacturers are required to establish certain data that is considered important for safe operation of the aircraft type. This data will be approved by the Agency under the type certificate and is then used by operators and training organisations. 5- data for qualification of simulators. The OSD concept is not entirely new; it succeeds the Operational Evaluation Board (OEB) that already existed in the Joint Aviation Authorities (JAA). The OEB was applied on a voluntary basis and resulted in recommendations to the national Aviation Authorities for the approval of pilot type rating training courses and minimum equipment lists (MEL). The novelty with OSD is that it is mandatory for the aircraft designers, ensuring that the data is available to the operators when needed. The OSD is the reference point for the customised training courses and MEL as developed by operators and training organisations. The OSD is expected to contribute to closing the gap between airworthiness and operations. This will be the case not only for new types, but also for changed designs. OSD will also be subject to continuous improvements. Furthermore it will set a level playing field in the EU for type training and MEL. The rule package necessary to implement OSD was developed in a long and heavy rulemaking process that started already in 2007. It includes amendments to several implementing rules and a series of new Certification Specifications (CS). The amendments to Part-21 and the OPS and Licensing implementing rules were published by the European Commission on 27 January 2014. The CSs for Flight Crew Data, Cabin Crew Data and MMEL as well as new guidance material to Part-21 were published shortly after that. The CS for simulator data will be published within the next weeks and the CS for maintenance certifying staff data is still under development. Transition from the OEB to OSD is taking place in several steps. As a starting point all existing OEB reports were grandfathered. For the remaining types that are still in production a catch up is needed before end of 2015. The relevant Design Organisation Approvals have to be updated to include OSD also before end of 2015. Operators and training organisations will have to implement OSD in their training and they have two years after the OSD becomes available from the aircraft designer. The OSD is a proportionate rule. It mainly applies to large aircraft and where it affects small aircraft the Agency has developed detailed guidance to facilitate compliance. One of the most frequent questions about aviation safety that is asked concerns when in the flight of an aircraft do the most accidents occur? 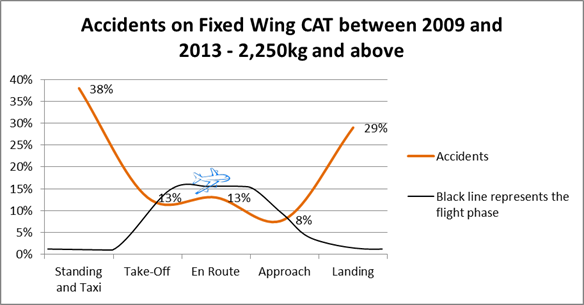 To help answer that question, the picture above shows the Phase of Flight in Fixed Wing, Commercial Air Transport accidents involving the EASA Member States between 2009 and 2013. EASA Member States in this context is defined as being where the state was either the State of Operator or the State Registry of the aircraft involved. The European Aviation Safety Agency has certified the new EC135 T3 by Airbus Helicopters, completing a new chapter in the development history of the EC135 family.